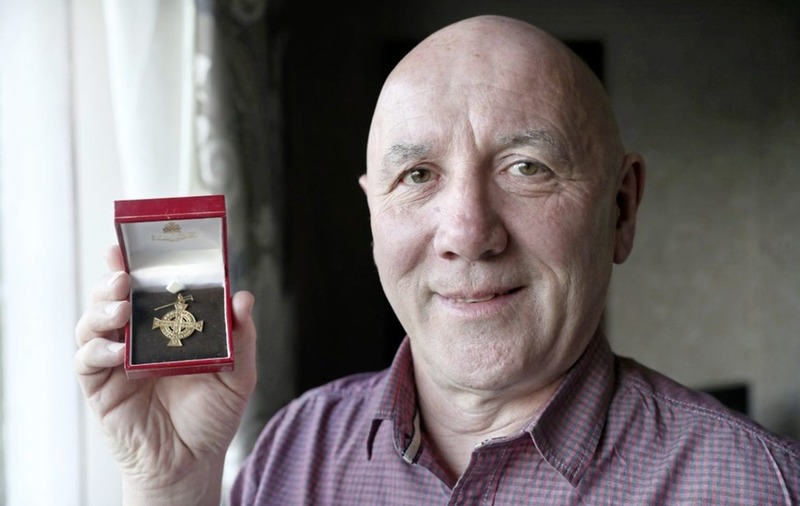 Irish News - Jock O'Connor - 2nd May 2018..Jock O'Connor with his 1979 Irish Cup winners medal and the shirt he wore on the day..
AS Cliftonville's team bus inched down Broadway, off the Falls Road, the freshest hope spurred it on. April 28, 1979 shimmered. A roaring sea of red and white. Hooped top hats, clenched salutes. The scarves, rosettes, the smiles and songs. At 19 years of age, John O'Connor was feeling lucky. Reds boss Jackie Hutton, a canny Scot, let him know. O'Connor, from nearby St James's Road, was in the 12. Portadown lurked as Windsor Park beckoned. Bertie Neill's side had already pipped Hutton's crew to a Gold Cup. But that was then. A first Irish Cup triumph since 1909 would crown the club's centenary year; this was the new tidemark teasing Solitude's sons. O'Connor and the rest lapped up their view. They'd hardly be halted now. A rich Cliftonville chapter was on the brink of being inked. For plenty, this would be the time of their lives. 'WEE Jock' rummages through the twists taken in a football career that fills him with pride and joy. The grandchildren will be told all about it too when everyone's ready. It's Friday afternoon, one day shy of 39 years since Cliftonville hands last cracked Spring skies with an Irish Cup. Luck on that front has been too hard to find for the Reds ever since the most sumptuous of Saturdays. "You talk about luck, I'd only signed in '78. I'd been over at QPR but I just came home one day," O'Connor recalls. "Wee Billy Smith, God rest him, had spotted me in an U21 final with Oliver Plunkett. I went over to London with Peter Dunlop, who was at the Reds too later on, and another kid. They came back sooner, but I was kept on. "I played a few matches, enjoyed it, but it was hard over there at 16 or 17 on your own. "I did well and was told I'd get a contract. But QPR sacked the manager... a caretaker came in and said 'you need to get fitter, try harder, blah blah'. "It ripped my heart out. I knew I needed improvement, I was only a kid. But I just threw the head up." A helping hand came from an ex-Linfield front-man taking strides in England's biggest smoke. "On the way back on the bus with the reserves this day, I was with big Billy Hamilton. "I said 'Billy, have you a motor?' He said he had. I said 'when this bus stops, throw me to the airport.' He said 'what?' I told him to say nothing. He gave me a lift, fair play, and I flew home. "I signed for about 50 quid, a few shillings a week. Ones about the Falls were asking me if I'd signed for the Reds. I said 'aye' and people were joking; 'F*** sake, Jock, are ye mad, people get shot for less.'" As O'Connor took his chances in north Belfast, Hamilton pressed on. World Cups with Northern Ireland and solid spells with Burnley and Oxford United sprung from his own Loftus Road grounding. There's not a flake of regret from O'Connor. Irish Cup winner medals 14 years apart are the pick of his harvest. The ex-postal worker remains thankful for what football has taught and brought him. From his Cliftonville debut against Linfield to his final bow in Bangor's Irish Cup final loss to the Blues in '94, all shades of memories were banked. Friendships, medals, tastes of Europe. That glorious spirit of 1979, though, is the thread that binds the yarn. "See the squad we had... I was so lucky touching for a club where it didn’t matter what you were or where you were from," he says. "Marty was at centre-half with big [John] Flanagan. Marty would have been the hitter, Flan the more skilful of the two. Marty might say different now... he's a serious case. "Ach, the bond kept it all going. They say happy teams get results. That was us. No pockets or cliques, just a close-knit bunch with big heart and a really good manager." A grippping chronicle got off to a flier for Hutton's charges despite a League campaign that chugged and spluttered. "Linfield was the first round, I started that game and played well," O'Connor remembers. "We beat them 4-3 over there, held them off and that kicked it all on. It just gave us a blast of confidence." Skelping the Blues, who snared a double the previous year, was the perfect springboard. "They were some team, Roy Coyle was player-manager so when you do the Blues like that in Windsor, you can beat anyone. What would have been the point not winning (the cup)?" Pages of headlines filled busy scrapbooks. Eighteen busloads of foot-soldiers were soon Coleraine-bound midweek for a nail-biting quarter-final joust. The Reds fed off the din before the bouncing bandwagons were hastily escorted from the hostile north-west terrain. "I'd come on and scored past big Vincent Magee. We won 3-2 and the crowd that night... Jesus, it was beyond belief. You can't explain that atmosphere, it really helped get us out of there with the win." A St Patrick's Day semi-final rumble with Larne at the Oval would put O'Connor on direct collision course with his closest friend. Brian 'Teddy' Quinn was "a magnet for cross channel clubs", a midfielder to be feared with "a vast repertoire of skills" according to Michael McGeary in these pages. Quinn, steeped in GAA, had only taken up soccer at 14. He would go on to earn 48 caps for the USA following a two-year stint in Everton's reserves. He just missed out on the States' World Cup squad of '94. 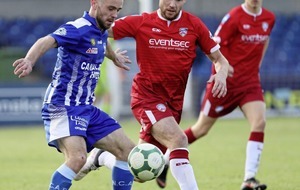 Only for Peter McCusker's brace in an edgy 2-2 draw, then some white-hot magic from John Platt after a five-week lay-off, Quinn might well have dragged Larne under Brian Halliday – Hutton's predecessor at the Reds - into the big picture. "It was a wild oul' night and Larne really went for it, but we got a penalty kick," O'Connor recalls from the replay thrashed out on a quilt of snow. "Just as Platt was about to hit it, some wee b****** threw a big snowball at him and I thought 'ah Jesus, he's missing this'." 'God', as Platt was known to his followers, was more than good. "I should have known, the big man never missed in his life. Knowing him, it would have ricocheted off the snowball and in. "I can remember 'Teddy' coming to Windsor for the final to cheer us on. He even ended up in our picture with the cup. It was all over the newspaper that night, red scarf and all on him." They would come from corners near and far to witness that tortuous final act. O'Connor's late father John, as always, was in their number. The Spion Kop swayed well before kick-off. Portadown fans on the north terrace had oiled their own vocals. Windsor screeched beyond belief. "There'd been a few incidents beforehand, riots and that with the cops. I remember Jackie Hutton and a few others went out to try and calm things and it all settled a bit," says O'Connor. "I came on for Walter [Mills], I think, with 20-odd minutes left. We'd been 2-1 up. Platt and big Susie (Mike Adair) got us in front. Then the Ports went up and scored at our end and you're just thinking..."
"Will Tony Bell fix it?... Yes! What about that?" THERE was barely a minute left. The long punt from Brian Johnstone. The smooth lay-off from Platt. Those questions from George Hamilton on the BBC footage to frame a dipping winner at the Railway End. "It was a just blur then, our fans went bananas, everyone did, the place exploded," O'Connor recalls. 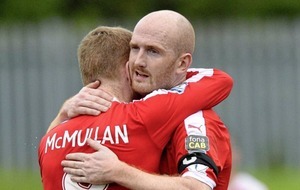 "We went back to Solitude on Tuesday and [Ciaran] McCurry was raging when I told him the craic. He said 'ye wee bollix, you should've said and I'd have gone too'. I said 'sure you were sitting with the wife'. "For months after it you never put your hand in your pocket. My Da didn't even know at that time that I took a drink." A Cup Winners Cup experience would follow later that year against a team bound for a last four clash with Valencia – Arsenal's eventual final conquerors. Nantes, thick with internationals, were held to 1-0 at Solitude nine days before a Papal visit to Ireland. When they got to France, the Reds needed more than prayers. "It was like a different sport," laughs O'Connor. "They scored seven screamers and our keeper was brilliant. I'm not sure one goal came from inside the box." 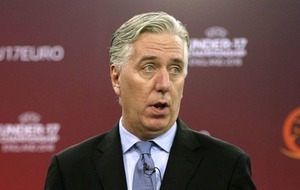 A Gold Cup at Linfield's expense was soon lodged. The squad, though, was starting to splinter. It was all over too soon for O'Connor's liking. "A couple of seasons and it all fell away... frustrating I suppose because I thought we definitely had a bit more in us," he reflects. 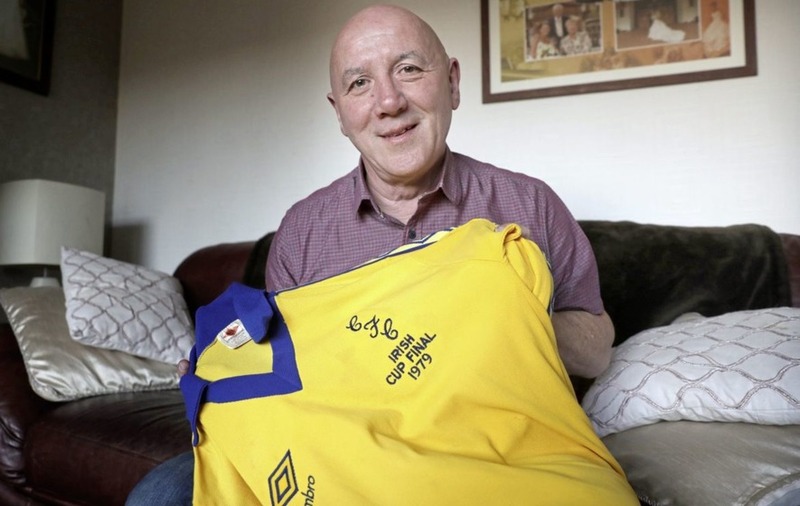 After detours to Ards and Portadown, a purple patch with a strong Bangor side crafted by his ex-Reds comrade John Flanagan would yield a fresh clutch of medals. The 1993 Irish Cup final against Ards on Nigel Best's beat took three games and a winner at the death from brash Celtic-bound Dubliner Paul Byrne to sort out. When Bangor's captain got his hands on the trophy, the old smile was familiar. Wee Jock O'Connor, at 33 years of age, was still feeling lucky. Tomorrow he inches back to Windsor on another bus with some fellow '79ers hoping to love what he sees. "Millsy has already been on to me. Me, him, McCusker, Eamon Largey and probably big Marty will be hooking up beforehand. There's a bus going from the bowling club so wouldn't it be nice to have an Irish Cup to celebrate all over again?"